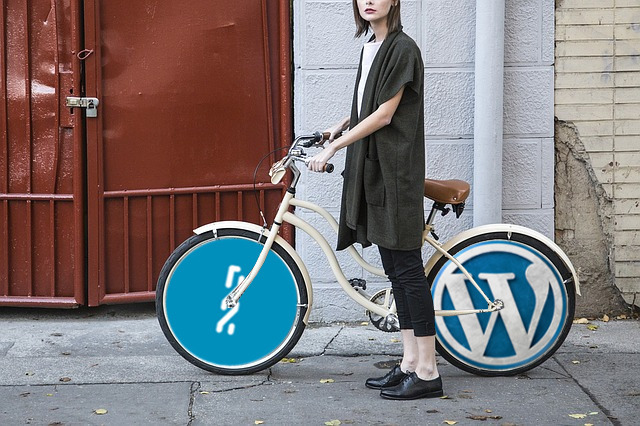 NxtBridge is a suite of easy-to-use Nxt plugins for WordPress. Design your own Nxt wallet, show live blockchain data in posts, or create your own ICO or asset site. Includes an offline signing client and soon also a mobile app. Stay tuned or contact us to join the development. NXTBridgeICO-header (place in brackets [ ]). NXTBridgeICO-offers (place in brackets [ ]). NXTBridgeICO-exchanges (place in brackets [ ]). NXTBridgeICO-stat (place in brackets [ ]). Collects asset data from the Nxt Asset Exchange, on the Nxt blockchain. You can show the data on your site by using shortcodes and the ID of the asset you want to show. The asset ID used in the examples above should be replaced with the asset ID of the asset you want to show. A feature of the NxtBridge Ledger plugin is the tip button. NXTBridgeTip account=Your_NXT_account amount=100 (place in brackets [ ]). 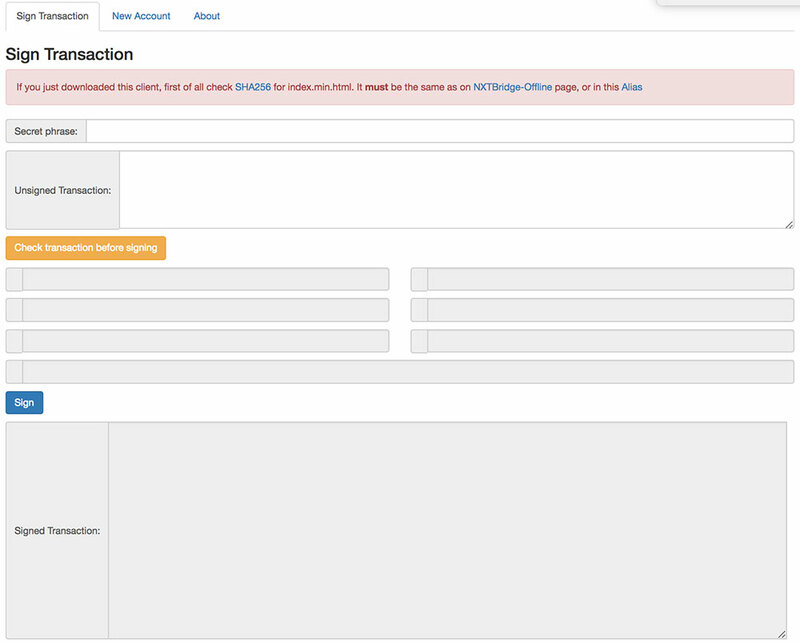 Click the TIP ME button to open the NxtBridge Ledger Dashboard, where you save your account ID and tip. As in the TIP ME screen but fill in any receiving account, amount and message you want. NxtBridge Ledger will create the unsigned transaction bytes, which you can sign and broadcast. Do this from a mobile app or broadcast with NxtBridge after checking and signing the transaction with NxtBridge OFFLINE. The reason for this step is that WordPress (or even a public NRS node) is never 100% secure. When you check and sign your transactions offline, you never expose your passphrase to the network. With NxtBridge Ledger you can safely broadcast your signed transaction bytes, no matter how unsafe the website. A simple html client that can create accounts and sign any Nxt (and soon Ignis + Ardor and child chains) transaction offline. 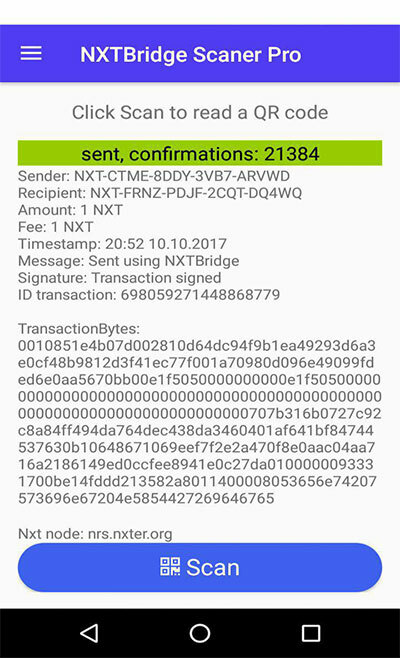 Sending NXT and using any Smart Transaction on the Nxt Platform is now 100% safe, as all can be signed with NxtBridge OFFLINE. You can send NXT, public or encrypted messages, buy/sell on the AE, create a poll or cast a vote, and a lot more. Watch the video tutorials and download NxtBridge OFFLINE here. 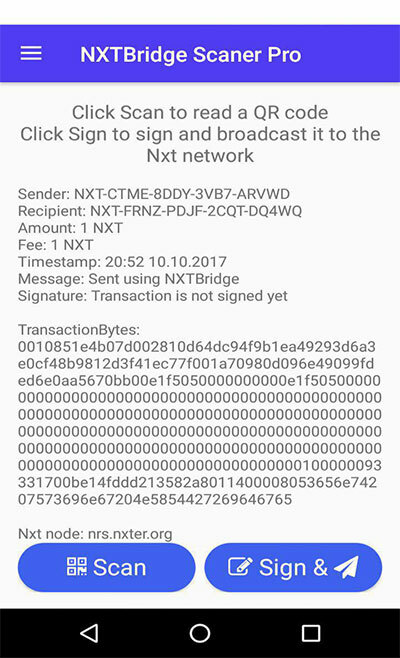 This simple yet universal Nxt app makes it easy to sign and broadcast any Nxt transaction. 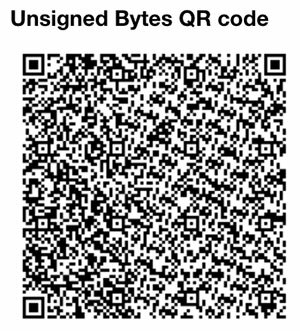 The lightweight app scans a QR (unsigned tx) from NxtBridge or any public NRS node, lets you sign it locally and broadcast it. Ideas, feature requests, questions, and any feedback is welcomed in the comments field below. Do sign up for our newsletters to receive updates – or contact us if you want to help us beta-test or join the development. I have a question .Is there an overview of all Nxt/ ardor/ ignis clones and airdrops at present and to come?